Lost and away. I feel my heart race. To look into the eyes of sage. Hold you in the freezing rain. As I pass through a tunnel into the dark. I wonder what tore us apart. Water lillies in a stream flooded by the nursery. Past , a haunted world Where the ribbons curl. bleeding hearts in a wind that whirls. I recall those last seconds when we said goodbye. Catching your tears before they dried. Down your face from mine . Through the kinks in your spine . From the last thing we spoke to the very first line. Love was something that we couldn't help but do. That something turned to someone else , Somebody new. I still love you after all. 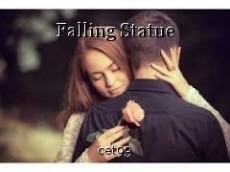 The betrayal that caused my statue to fall. I lay within a silent skin. That longs for your touch once again. I've spent my mourning on my knees. Praying for lost time to freeze. In a past glimpse , Where I kissed you through and through. Bright blue skies held a passion moon. Underneath the stars , where we forgave our scars. catching fireflies in antique jars. Dancing to your favorite song. Not knowing that this love would turn out wrong. I was a man once standing tall . A time before I watched my statue fall . I come up to the corner of your new home. A hole in my chest that needs to be sewn. Gazing through the window You have your arms around him. I fall into a world of sin. You left a love that loved you most. Father time gently kissed you In love's home. One night when the candles burned. A traitor of a heart began to turn. To hell with a smile. A life weak and mild. Buried was a man who once drove her wild. He has come undone. He sleeps with a gun. Sometimes , he wonders if he'll see the rising sun. Painted red were the bedroom walls. A wedding picture witnessed it all. A man in love can't have her after all. Now that horror has forced his statue to fall.